I was immediately drawn to the awe-inspiring set design as I sat down in my seat. 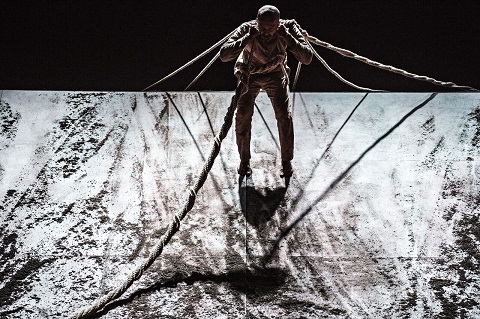 A small hill sat on the stage holding a number of ropes that hung effortlessly from the top. Two live singers and musicians sat at the bottom of the hill singing sounds that reminded me of my days in India. A flickering light hung from the top making an eerie sound when the power would go out — as it so often does in India. And it was in that moment, I was pulled into Akram Khan’s compelling story about humanity, love, rebirth and loss. A story that would take me back to India during WWI, where I could imagine what life would have been like as an anonymous soldier fighting for their life under colonial rule. Khan gave voice to the voiceless by unlocking an important part of history and relating it to present time. The show created lots of space for audiences to get curious about the question of just how much our humanity has or has not changed over the years. Have we really evolved since WWI? One of my most favourite parts of Khan’s work is his relationship with the musicians on stage. The live performers are very much part of the whole experience and are just as important as the dance itself. The best way to describe this relationship is by seeing the dancer and musician in a dialogue. The dialogue is continuous and the feelings are often mutual. In Indian classical dance, live musicians often play a central role on stage with the dancer. The beats coming from a dancers feet align wonderfully with the sounds of a drum. Khan plays on the history of the Indian dance art form and adds another level to it by engaging with the musicians through eye contact and/or subtle gestures. XENOS offered that experience up to the members of the audience who are free to interpret how or what to feel as the artists creatively exchange rhythms between each other. XENOS – which means stranger or foreigner – took me into a journey that was gripping and heart-wrenching. Khan’s physicality for the 65-minute performance left me breathless. Moments where he stood or lay at the top of the hill had me on the edge of my seat. He is definitely one of the bests in the dance industry but as rumours have it, his solo career as a dancer may be ending soon as he ponders retirement letting go of the vigorous dance forms and focusing on his work as an Artistic Director. Either way, his shows are not to be missed! A must watch for all dance lovers out there ! XENOS plays at Canadian Stage (26 Berkeley St) until October 21st, 2018. Tickets can be purchased in person or online. The play runs 65 minutes, no intermission.